Charlie Gard’s parents reportedly stormed out of a London courtroom Thursday, July 13, after a British judge discounted their efforts to get their dying son experimental medical treatment in the United States. Charlie Gard is on life support at Great Ormond Street Hospital, one of the world’s leading children’s hospitals, while a legal battle rages over whether his parents can take the terminally ill infant to receive experimental treatment for his rare genetic disease—mitochondrial depletion syndrome. 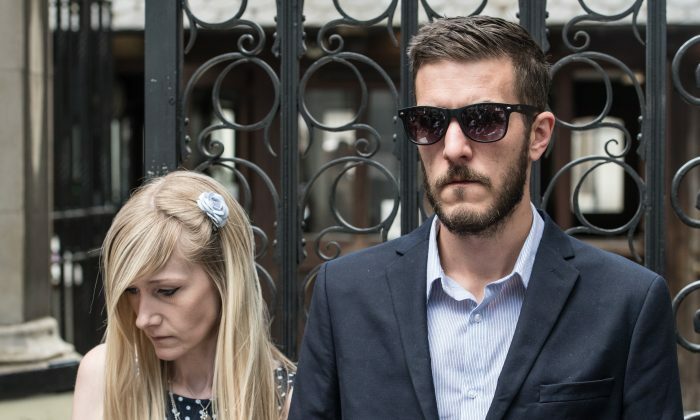 Charlie Gard’s parents disagree with the hospital assessment on how best to care for their 11-month-old child whose illness has left him brain damaged and unable to breathe unaided. The hospital argues the American treatment won’t help and may cause the child suffering. Chris Gard and Connie Yates reportedly stormed out of Thursday’s hearing when the judge suggested that their arguments have been inconsistent. The case has garnered sympathy internationally, with the pope, President Donald Trump, and Vice President Mike Pence, all offering help to the child. U.K. law tasks judges with deciding the route a child’s care takes when the parents and hospital disagree. On Thursday, Chris Gard punched a table, according to news reports. Cost does not seem to be an issue with some 1.3 million pounds ($1.68 million) having been raised to help Charlie leave Britain for treatment. In April, Judge Nicholas Francis ruled in favor of doctors who want to withdraw life support. The judge has said he will consider new evidence but time is running out. The parents tried appealing to the European Court of Human Rights but the case was rejected. A previous hearing ended with the baby’s father yelling at the lawyer for the hospital and the mother crying. The hospital has said the treatments the parents want to try are unjustified because they don’t represent a viable cure. The nucleoside therapy they want to get is not approved by the FDA. The case came into the international spotlight after President Trump and Pope Francis brought attention to it. Pope Francis issued a statement insisting on the need to respect the wishes of the parents to “accompany and treat” their son to the very end. Pope Francis wrote that complicating the whole story was how these tragic events have contributed to “an invasive and destructive culture of waste” that hurts the weakest and makes vague the distinctions between truth and falsehood. Vice President Mike Pence said the case is a story of a single-payer health care system. So the heartbreaking story of the 11-month-old Charlie Gard in England is a story of single payer healthcare that does not give patients the same kind of choice. “That’s what single payer looks like. We hope and pray that little Charlie Gard gets every chance,” said Pence. His statement overlooks, however, that British law gives parents fewer rights to make decisions for their children. A huge crowd gathered outside the courthouse for the hearing. A decision is not expected on Thursday.